Study Shows Governments Are Paving The Road To Forest Finance; Will Paris Let The Private Sector Use It? The public sector now accounts for most of the money that industrial countries are spending to help forest nations slow climate change by saving forests, but that government money is meant to prime the pump for private-sector finance. A new report shines a light on how that funding is being spent – and what it means for the future of private-sector finance. 16 November 2015 | We’ve all heard the story of the blind men and the elephant – how each man grabbed a different part of the animal, and each ended up with a different idea of what an elephant actually was. The man who grabbed the elephant’s trunk thought it was a snake. The man who grabbed the elephant’s tail thought it was a rope. The man who grabbed a leg thought it was a pillar, and the man who grabbed an ear thought it was a husking basket, whatever that is. Tracking climate finance is like that: even if we’re expert in one segment, we rarely see the whole picture, and each of us seems to have a different idea of how it all fits together – nowhere more so than when we’re looking at programs that aim to slow climate change by saving forests and reducing emissions from deforestation and degradation (REDD). Some of us think of individual projects aimed at tapping private-sector finance to conserve one specific patch of high-value forest, while others think of nationwide programs like the ones Norway has been championing since 2008, or of “jurisdictional” programs like the one Germany is supporting to help indigenous people save their forests in Brazil. Then there are nebulous multilateral efforts like the World Bank’s BioCarbon Fund, that always seem to be doing something – but we’re never sure exactly what. 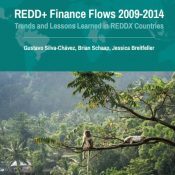 A new report entitled “REDD+ Finance Flows 2009-2014: Trends and Lessons Learned in REDDX Countries” provides a bit of braille to our elephant. Published by Ecosystem Marketplace publisher Forest Trends through its REDDX finance tracking initiative, the report examines financial flows from industrial countries to 13 forest nations that, combined, are home to 65 percent of the world’s tropical forests. The report confirms some things we’ve always known – for example, that Norway leads all donors, and that Brazil leads all recipients. But it also quantifies these flows with a new degree of precision and pushes new findings into the light in ways that offer deep understanding into where REDD money comes from and where it goes. Norway, for example, isn’t just leading the pack in spending, it’s responsible for a whopping one-third of all money going into REDD finance; and Brazil is the biggest recipient by far, in part because 90 percent of the money promised to it has been delivered. The report also shows that promises made by one country directly to another are kept faster than those funneled through multilateral efforts, and that forestry commissions and other implementing agencies are getting the bulk of the money – as they should, because these early payments are intended to lay the groundwork for “payments for performance” to come later. The report covers 13 countries and was compiled with local in-country partners. Future reports will focus more on how money is disbursed internally. Forests Look Set To Play Big Role In Paris Patchwork Climate Accord, which takes a look at the state of forests in the negotiations taking place soon in Paris. Paris And The Amazing Technicolor Charm-Quilt: Why This Year’s Climate Talks Really Are Different, which offers a simple introduction to the new negotiating dynamic that began in Warsaw at the end of 2013 and will be central to this year’s talks in Paris. The authors differentiate between pledges (which are non-binding promises), commitments (legally-binding promises with specific obligations) and disbursements (the money flows). By the end of 2014, roughly $10 billion had been pledged globally, and the study focuses on 13 REDDX countries accounting for $6 billion of that. Roughly $3.7 billion of the money pledged had become formally committed and 62 percent of those funds had been disbursed – but not all commitments were kept equally. Brazil, which accounted for 42 percent of all commitments, had received 91 percent of its money, while Mexico had received just 10 percent of its, despite the fact that Brazil’s national climate action plan (technically called an “INDC”, for “Intended Nationally-Determined Contribution” under the United Nations Framework Convention on Climate Change) explicitly rules out market-based international REDD payments, and Mexico is explicitly courting such payments. Mexico, on the other hand, appears to be suffering from bottlenecks within the disbursement system. “This trend is mainly due to the fact that a US$350 million loan commitment made in 2012 from the World Bank to Mexico’s National Forestry Commission has yet to begin making significant disbursements,” the authors say – adding that Ghana, Liberia and Ethiopia have also received less than one-third of the money committed to them. “The reason for this is that in each of these countries, the majority of REDD+ commitments were made in 2013 or 2014 and donors therefore have yet to begin making large disbursements,” they write. Three-quarters of the finance tracked by REDDX to date has gone towards “readiness” activities – the things countries need to do to prepare for reducing deforestation at a large scale, such as building capacity within government agencies, meeting with stakeholders, and developing baseline deforestation data. A much smaller portion – $913 million in the 13 countries – has gone to pay for emission reductions, which of course is the ultimate goal of REDD+ programs. Norway was the first donor country to forge performance-based agreements. They put $1 billion on the table for Brazil in 2008 and offered another $1 billion to Indonesia. These are considered “pledges” within the REDDX methodology because the finance is conditional on the emission reductions being measured and achieved. And indeed there were very different results in Brazil versus Indonesia. By reducing its deforestation rate to a level 80 percent below 2004 levels, Brazil has prevented an estimated 516 million tonnes of carbon dioxide from entering the atmosphere. The Brazilian Amazon Fund was set up in response to the Norway agreement and has now received almost all of the $1 billion pledged through the end of 2015 and has been disbursing the funds to Amazonian initiatives. A different story is unfolding in Indonesia, however. Palm oil concessions were no match for REDD, and deforestation has continued at a devastating clip. By the end of 2014, only about $50 million of Norway’s $1 billion pledge had been paid out – a successful example of “non-payment for non-performance” but a very unsuccessful example of reduced deforestation. Nevertheless, Norway’s performance-based payment agreements with Brazil and Indonesia signaled the beginning of a trend. “Donor countries are increasingly requiring REDD+ countries to demonstrate the concrete progress they are making in tackling deforestation, and then transferring funding if and when positive results are achieved. If countries don’t reduce their deforestation, then they don’t get the donor money,” says Brian Schaap, a Forest Trends senior program associate and co-author of the report. Norway has recently made smaller performance-based pledges to Peru ($300 million), Guyana ($250 million), and Liberia ($150 million), and the REDD Early Movers program funded by both Germany and Norway has put money on the table for the state of Acre, Brazil as well as Ecuador and Colombia. The World Bank’s Forest Carbon Partnership Facility is also moving from readiness to performance. Its Carbon Fund, which has $465 million in its coffers, has now signed letters of intent with 11 countries –the first step towards signing agreements to pay for emissions reductions. One of the big question marks in the transition from readiness to results is whether public-sector finance will pave the way for private investment in reducing deforestation. Companies active on the voluntary carbon markets have spent $381 million on offsets from the 13 countries tracked by REDDX, according to data culled from Ecosystem Marketplace’s recent State of Forest Carbon Finance report, with another $36 million in private money committed to readiness. That, however, is only 10 percent of the total in the 13 countries tracked, and for REDD to deliver on a large scale, tropical forests have to attract more private sector investment, according to the report authors. Private sector involvement would be “one of the most economically efficient ways to both protect vast areas of tropical forest and reduce global carbon emissions,” they write in their recommendations.